The redesigned Performance Plus 2.0 Series 2-Door Base Cabinet provides total durability with flexible storage space. The frameless design is built from fully-welded, 18-gauge steel and finished with heavy-duty stainless steel handles. It features a fully adjustable pull-out shelf on soft close drawer slides, a cable management solution that allows you to charge your tools behind closed doors, and an integrated top tool tray lined with premium rubber that allows you to keep your tools on hand while you work. 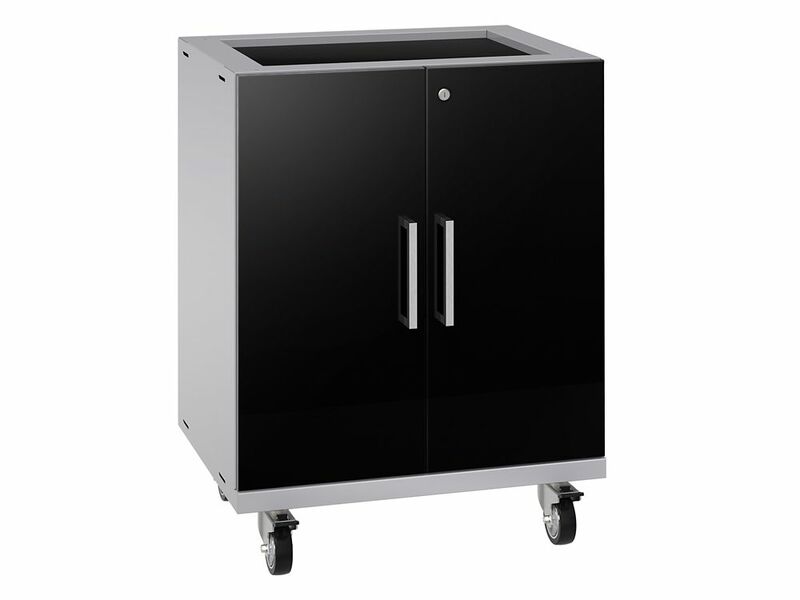 This cabinet is shipped with heavy-duty lockable casters, making your cabinet fully-mobile; bolt it together to another Base or Tool Cabinet, creating a mobile workstation. It can also be installed on the included height adjustable levelling legs, or remove legs completely for wall mounting or stacking Base Cabinets. Performance Plus 2.0 Series Base Cabinet in Black The redesigned Performance Plus 2.0 Series 2-Door Base Cabinet provides total durability with flexible storage space. The frameless design is built from fully-welded, 18-gauge steel and finished with heavy-duty stainless steel handles. It features a fully adjustable pull-out shelf on soft close drawer slides, a cable management solution that allows you to charge your tools behind closed doors, and an integrated top tool tray lined with premium rubber that allows you to keep your tools on hand while you work. This cabinet is shipped with heavy-duty lockable casters, making your cabinet fully-mobile; bolt it together to another Base or Tool Cabinet, creating a mobile workstation. It can also be installed on the included height adjustable levelling legs, or remove legs completely for wall mounting or stacking Base Cabinets. Performance Plus 2.0 Series Base Cabinet in Black is rated 4.8 out of 5 by 13. Rated 5 out of 5 by TJ from GREAT CABINET ! GREAT CABINET ! Rated 5 out of 5 by Nick from Super nice cabinet This is 1 of my favorite pieces I got, love the smooth sturdy pullout drawer with its easy/quick height adjustment tracks! This piece only needed slight door alignments for height & squareness. Rated 5 out of 5 by jamesH from double door rolling cabinete great construction / solid and steady cabinet. great wheels for rolling around garage to work area or for cleaning under the tool bench etc.